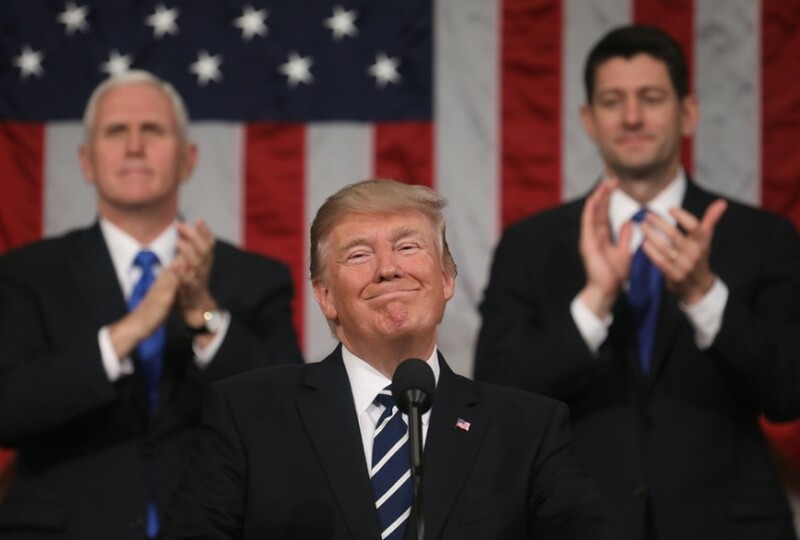 Donald J. Trump delivers his first address to a joint session of the US Congress as Vice President Mike Pence and Speaker of the House Paul Ryan listen, February 28, 2017. 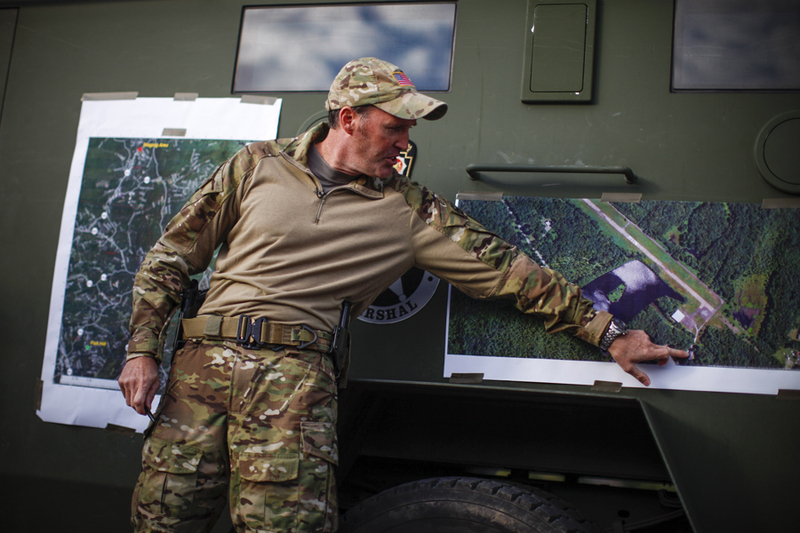 CRESCO, PA - OCTOBER 31: Scott Malkowski, Task Force Commander, US Marshals Service, Special Operations Group, show the map of the operation in which they captured Eric Matthew Frein on Thursday night while he talks with members of the media on October 31, 2014 in Cresco, Pennsylvania. Frein, a suspected cop killer, was taken into custody from a Pennsylvania airport hangar after a seven-week manhunt. This contrast, between Trump’s rhetoric and the reality of domestic terrorism, extends far beyond Pennsylvania. 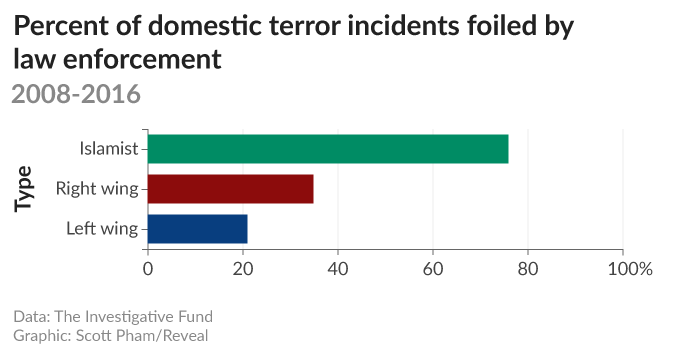 A a database of nine years of domestic terrorism incidents compiled by The Investigative Fund at The Nation Institute and Reveal from The Center for Investigative Reporting has produced a very different picture of the threat than that advanced by the current White House. Listen to Sarah Posner on CNN, Al Jazeera and KCRW. Read coverage of this investigation in Newsweek, Vice, Teen Vogue, Columbia Journalism Review and Salon. 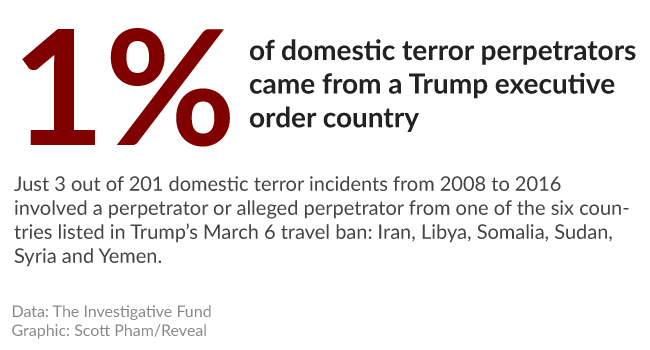 The second case is one of the three incidents in our database involving people from countries included in the executive order, all of them from Somalia. 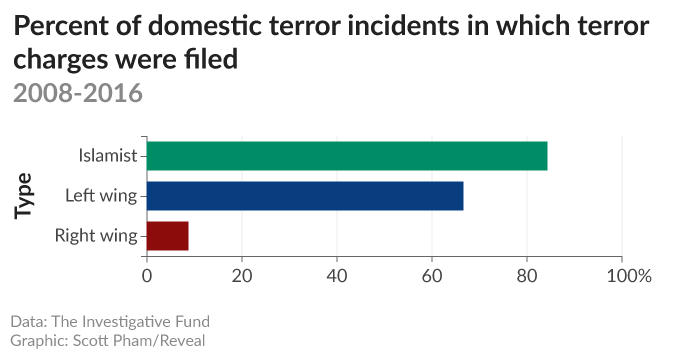 Two of the incidents were pre-empted plots, one of which — the Portland “Christmas tree bomber” case the order cites — was an elaborate sting operation. 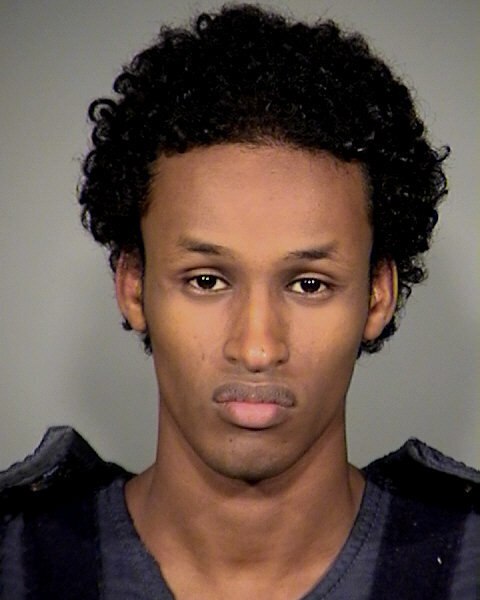 The response to Mohamud’s father’s call for help — surveillance and a sting — underscores another disparity: the federal government’s disproportionate commitment of investigative resources to rooting out Islamist terrorism. The FBI coordinates with a variety of federal agencies — such as the Bureau of Alcohol, Tobacco, Firearms and Explosives and the U.S. Marshals Service — that work domestic terrorism cases on an ad hoc basis. 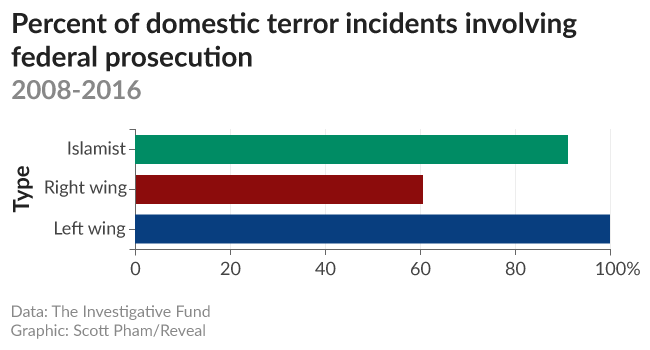 Other terrorist plots and acts are investigated and prosecuted only by state or local officials, who often bring more straightforward charges, such as murder, assault or arson. Still other terror cases never are prosecuted at all because no suspect is identified or the perpetrators are killed in the act. 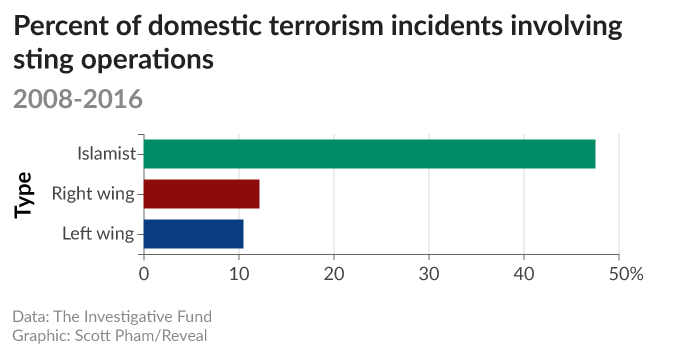 But according to Johnson, who joined the Department of Homeland Security in 2004, the FBI formally tracks only the cases the FBI investigates itself — which risks leaving out many incidents that fit the federal criteria for domestic terrorism. 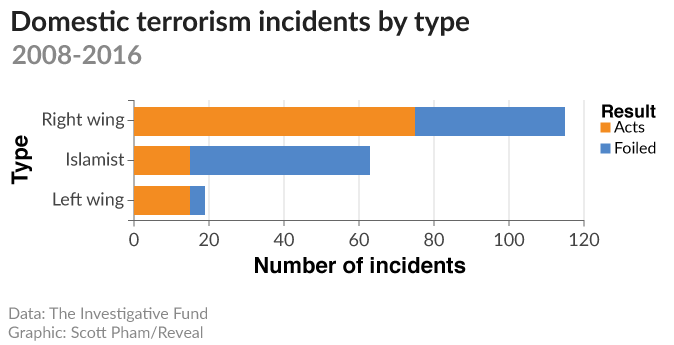 Moreover, three-quarters of the Islamist incidents in the database were pre-empted plots, including elaborate sting operations, while 35 percent of far-right incidents were pre-empted, a much smaller ratio. 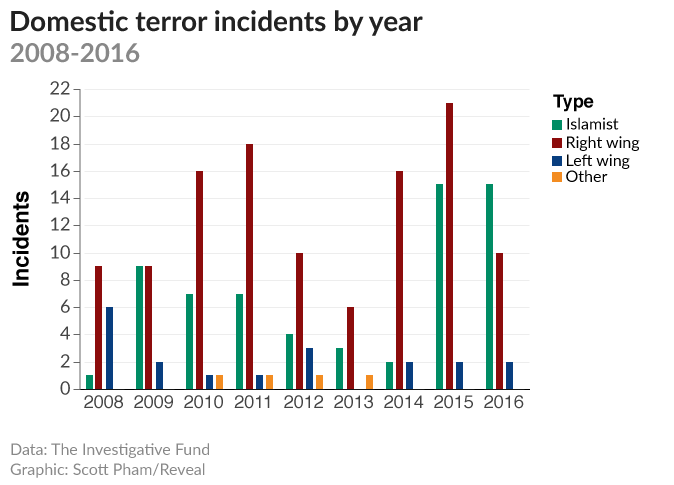 That disparity, counterterror experts say, is an indication that far fewer investigative resources — such as analysts, paid informants and undercover operatives — have been deployed to halt far-right attacks. 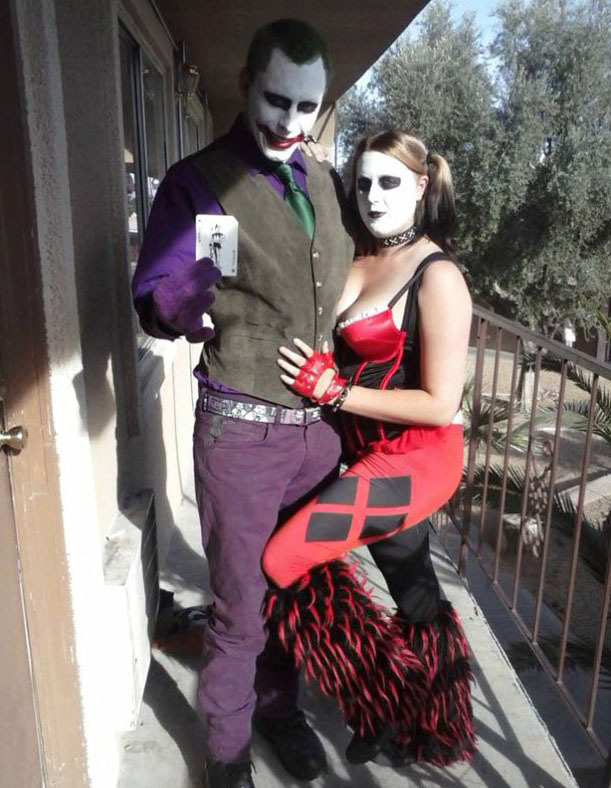 In 2014, Jerad and Amanda Miller walked into a Las Vegas pizza restaurant and shot and killed two local police officers on their lunch break. Then the married couple fatally shot a shopper before dying during a shootout with responding officers. Despite law enforcement concerns about lethal attacks against police sparked by the Black Lives Matter movement — captured in the slogan “Blue Lives Matter,” along with dozens of bills extending hate crimes protections to police – only two incidents of domestic terrorism in the database can plausibly be attributed to a perpetrator with such sympathies. They are the December 2014 killings of two police officers in their patrol car in New York City and the July 2016 sniper shooting in Dallas, which left five officers dead and nine wounded. This story was reported in partnership with The Investigative Fund at The Nation Institute, now known as Type Investigations, with support from The Puffin Foundation. Darren Ankrom of The Investigative Fund, Reveal reporter/producer Stan Alcorn, and Reveal senior reporter Katharine Mieszkowski contributed to this story. It was edited by The Investigative Fund’s Esther Kaplan and Reveal’s Amy Pyle and copy edited by Nadia Wynter and Nikki Frick. David Neiwert is an investigative journalist based in Seattle and a contributing writer for the Southern Poverty Law Center.